One year after the end of the Seven Years War the 28th Foot were on garrison duty in Montreal. 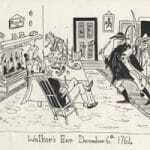 Day-to-day life was made very difficult for the soldiery there by one Thomas Walker, an important merchant and magistrate of the city, particularly with regard to his failure to provide them with adequate quarters during the severe winter weather. The 28th decided to take revenge and on the night of 6th December a group of disguised men burst into Walker’s house as he was sitting down to supper, beat him up and sliced off half his right ear. The culprits were never brought to justice, although there was plenty of circumstantial evidence implicating Captain Payne, Lieutenant Tottenham, Sergeant Rogers, Sergeant Mee, Private Coleman, Private McLaughlan and four others. David Scott Daniell, “Cap of Honour”, 2005. Picture: Cartoon of the Walker’s Ear Incident. Original in the Soldiers of Gloucestershire Museum.